Mon, Apr 16, 2018, 06:18 pm SL Time, ColomboPage News Desk, Sri Lanka. 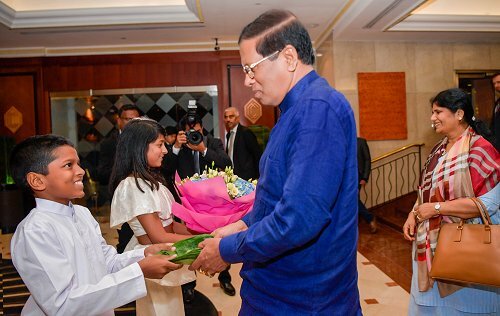 Apr 16, London: Sri Lankan President Maithripala Sirisena reached London Monday morning to attend the Commonwealth Heads of Government Meeting (CHOGM) 2018. He was received by the Commonwealth officials and Sri Lanka High Commission staff. President will take part in the CHOGM, which is held from April 16-20 this year under the theme "Towards a Common Future" and the special attention will be given to the areas of prosperity, security, fairness and sustainability to achieve the goals of Commonwealth countries. Within the official visit, President Sirisena is scheduled to meet the British Prime Minister Theresa May and also to hold discussions with several state officials who will be participating on the Commonwealth Heads of Government Meeting. The President is also scheduled to address the Commonwealth Business Council (CBC) and is invited to deliver the keynote speech on the conference regarding achieving sustainable development goals. President Sirisena will attend the special celebration of the 92nd birthday of the Queen Elizabeth. He will also visit the Buddhist shrine in London to pay homage.